Clarissa Dickson Wright | Helen Aurelius Haddock - A Writer's Blog. Here is a link to the article I wrote for Flavour Magazine. (pages 26 &27). Please click on the PDF file on the following page to open. I have put the unedited version below. For more information about the book click the link below. 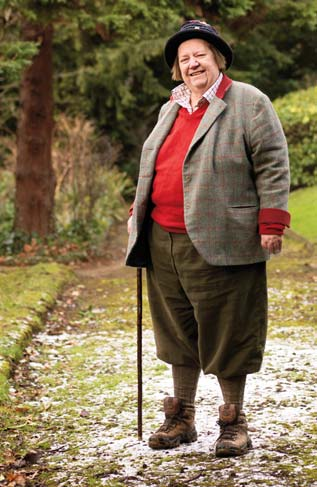 This month Helen Aurelius-Haddock takes a hike North of the boarder to Edinburgh to talk to Clarissa Dickson Wright about her latest book Potty. I met Clarissa amid a flurry of paper work, a verbal joust with the owner of the establishment over a delivery of an octopus and a deferential conversation with one of her many admirers. Aptly chosen, we met at Edinburgh’s Valvona & Crolla, a place that every shopkeeper in the land should visit as a shining example of how to seduce the public into buying good food. Her latest foray into the culinary arena is Potty, a collection of dishes that need just one pot to cook them. The idea itself has an immediate appeal in the frenetic British lifestyle so many of us lead. Recognising that not all of us have the space or time we need, she quickly rose to the challenge and used her extensive repertoire and flavour palette to create a jaw dropping collection of dishes that would grace the best of tables for any occasion. Admittedly, ‘the pot’ has been used as a concept in some of the recipes. Pastry cases, tin mugs and whole vegetables are garnered to form vessels to encase a host of mouth-watering food. Influences of Spain, the West Indies and Malaysia are infused into the dishes, providing a spice-laden backdrop to some of the other more traditional British fare. The resultant dishes range from dumplings to dfeena, paella to pies, and tofu to tarts. Inevitably we then strayed into the minefield where Clarissa so boldly likes to tread – her distaste for supermarkets. Importation of food instead of supporting British producers, tracking welfare and quality of food on our own turf, a desire to see the countryside prosper and the poor treatment and payment of farmers, were the reasons she cited. Only Waitrose escaped her scathing criticism by a whisker on the farming front and Starbucks were praised for saving our dairy industry by only serving British milk. In her time, Clarissa has owned her own bookshop in Edinburgh and run the infamous Books For Cooks in London. She is amazed at the sheer volume of cookery works that are produced every year. Like owning a language CD, she opined that people love to fantasize over mouth-watering food shots and recipes, and, as if by some magical osmosis, they too will be able to cook it. At 63, it seems she has no plans to retire. Her next book The History Of English Food showcases her not only as a cook, but as an astute food historian with an encyclopaedic knowledge of her subject coupled with a voracious appetite for discovery. Her research however, has been wholly devoted to reading after a recent tussle with Wikipedia and Who Wants To Be A Millionaire? “Never trust the internet,” she advised, “I had to ring and tell them that Alexander Armstrong was not my cousin. Of course they apologised profusely”. Who wouldn’t when quizzed by this Grand Master? There are plans for more books, and she hinted at a desire to write a novel. Scheduled television appearances are adding up as well. She will be teaching Michael Ball to cook, describing him as ‘an awfully nice chap you know’, and taking part in a series called The Great British Food Revival. Others will follow, but are still in their early planning stages. It seems that CDW is about to enter a Renaissance period of her own. Well deserved for one so capable in food related matters. So, whether you decide to get back to basics with her Primordial Soup or indulge yourself with the Tablet and Cheshire cheese pie, her latest culinary treasure is most definitely one for the kitchen book shelf, destined to be lovingly splattered with evidence of its regular appearance by your side in the kitchen. Good food, less dishes. Yet another winner on all sides from Clarissa. 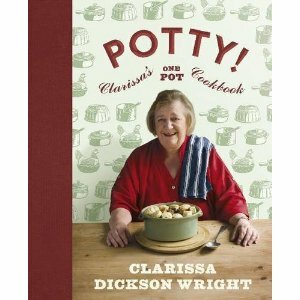 Wright on Time – Potty by Clarissa Dickson Wright. ← Conserves Maison – Preserving the Harvest. I love Valvonas BUT most of us have to live in the real world….. £SD.